255: Friday FAQ, Smart Simple Fat Loss: Eliminate Limiting Beliefs. For years I believed the path to leanness was paved with hours of cardio. And a zero fat diet. I also accepted that genetically I was ‘meant to be’ fairly chunky on the bottom and scrawny up top. Hips and thighs were just where my fat gravitated to right? And if I got super extreme with running and cutting everything out of my diet my lower body would get acceptably lean – at the expense of a now emaciated looking face and upper body. As you can imagine these beliefs were not working particularly well for me. Today’s show – part 3 in the series – is dedicated to freeing you of the beliefs that are making achieving your ideal body impossible. Today, Smart Simple Fat Loss: Eliminate Limiting Beliefs. I covered part 2: Smart Simple Fat Loss: Align Your Goal in the #250 show. and part 1: Smart Simple Fat Loss: Define Your Goal in the #245 show. What we’re going to do is eliminate the beliefs that are not propelling you towards the attainment of your body gain goal. Why is it important to have zero tolerance for such beliefs? If the way you think is not in support of your body gain goal than it is absolutely in conflict. There is no status quo as far as your beliefs. Limiting beliefs sap the life out of your best intentions. They attract more of the same. More energy sapping, confidence eroding, insidious thoughts and beliefs that make it impossible to realize your goal. 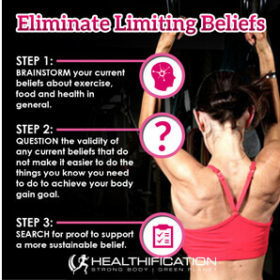 How to eliminate your limiting beliefs and ensure your thoughts are HELPING you gain your ideal body and ideal health. Step 1: Brainstorm your current beliefs about exercise, food and health in general. Beliefs at this level are called Global Beliefs. Everything you feel to be true about the world around you. They determine how you interact with the world. You will filter in evidence to support your current beliefs… and filter out evidence that does not support your beliefs. For example: What is exercise to you? Boring, hard, tedious? A necessary evil? Vanity? Something to be endured – when you have nothing better to do? This is not my belief, however if I chose to entertain this belief I could absolutely find evidence to support it: treadmill trudging, spin classes, trying to increase my weights every session, sticking to the same old program… and so on. In contrast could exercise be: a tool to create a strong, fit, healthy body that allows me to wear whatever I like and have the energy to do whatever I like? Precious, fun and indulgent me time? A reward? A social event? A chance to show others your love or to demonstrate your prowess in the kitchen? Perhaps, What is clean eating to you? Bland and time consuming? Expensive and restrictive? Something to be endured as punishment for a weekend of ‘normal eating’? 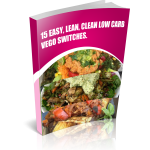 In contrast could food – even clean eating be: how you ensure your body looks, feels and functions optimally? A chance to get creative and make yummy meals that you love and that support your best health? Step 2: Question the validity of any current beliefs that do not make it easier to do the things you know you need to do to achieve your body gain goal. Often our beliefs have just come to be without any real volition of our own. We accept them unquestioningly. AND too often we accept the (unacceptable!) results they deliver to us. It’s one thing to unconsciously allow this to be the case. It’s time to take back control of the beliefs that are not working for you. For a number of years I held tight to the belief that all cardio was either punishingly boring and time consuming or impossibly hard and exhausting. When I questioned that belief it really did seem to be a little extreme. Perhaps even an excuse to conveniently give myself an ‘avoid hard cardio at all costs’ card. Step 3: Search for proof to support a more sustainable belief. When the student is ready the teacher will appear right? I guarantee once you become open to the possibility of something, opportunities and examples will start to show themselves. In fact they’ve always been there – it’s just that now you have your blinkers off so you can see them. You’ll begin to filter in the proof that will help you, rather than filter it out. I began to see body weight work-outs that had the same cardio effect and yet were just as fun (to me!) as lovely weights. Or the super-crazy-short Tabata style training that could see me on and off the hateful treadmill in 6 minutes flat. If you’re stuck as to where to start, take a look at the people who have the results your seeking. Imagine what their beliefs might be? Or simply just ask them how they think of exercise, food, or health in general. People who are doing well – in any aspect of their life – are generally fairly willing to discuss it. Lets put this into action. It’s the time of the actionable! First: Grab a piece of paper or open a new doc and brainstorm your current beliefs about exercise and food. Anything goes, so don’t judge or edit your responses just get them all down. It’s ok for a belief to change. The only important factor surrounding your beliefs (as long as they are not hurting anyone else) is, Does it get you the result you’re seeking? Finally: Hunt down the proof to support a more sustainable/supportive belief. That proof is there, it’s all down to your willingness to accept it and to accept the results it will make available to you. I almost forgot: so I mentioned one of my old limiting beliefs was FAT MAKES ME FAT! WOW, I couldn’t have been more wrong, in fact Good fats are your fat burning friends. 1. Swap your morning pastry, muffin or banana bread: for oats spiked with delicious nut butter (I LOVE almond, cashew and brazil nut butter), and seeds (like hemp + pumpkin seeds). 2. Swap butter or worse margarine: for avocado. 3. Swap store bought mayo or dressing: for a simple home made option. 1 handful of basil leaves or coriander (small handful – part leaves part stems). 1 avocado. 1 tablespoon lime juice. 3-4 tablespoons coconut cream. Salt to taste. Finely chop basil in the food processor. Add avocado, lime juice, coconut cream and blend until smooth. Season with salt. 4. Swap a chocolate bar or biscuit: for 50 gm of un-salted nuts. 5. Swap chips: for kale crisps. 1/2 a big bunch of kale (washed, ripped into chip sized pieces and dried with a tea towel then patted super dry with paper towel). Place kale into a plastic bag with oil and seasoning and shake till well coated. Sprinkle onto a baking sheet in a thin layer (use multiple pans if making lots and cover baking sheets with cooking paper for easy clean-up). Bake at around 180 degrees celsius and watch carefully till it starts to brown and crisp up. The time varies depending on your oven and the amount of kale – but it’ll be around 20 minutes. 6. Swap processed and fake energy / protein bars: homemade protein balls. 7. Swap a fast food shake or choc milk: for a home made shake with a tablespoon of nut butter. Simply dump all ingredients in a blender and blend! What are your fav good fat swaps? In next Friday’s #260 show I’ll cover Part 4, Smart Simple Fat Loss: Educate and Accelerate. That’s it for this week in Healthification. Big thanks to you for your support. It rocks. If you’d like me on your team to help put these actions into place check out The Strong Body Green Planet Community. Inside the community my main focus is: to make the mindset component of creating a fit, healthy plant strong body simple, implementable and sustainable.